We have an active pretend area in our classroom and decided it was time to encourage children to think together about how themes might be expanded. Every day children choose between home and family themes like cooking dinner or caring for babies, setting up a restaurant to going out to eat, or opening a doctor’s office. What else would be fun to pretend about together? Rather than rush the process, we returned to the conversation on multiple days so that we could judge what was still important to the children. It became clear we needed to build a conveyor belt. But how could we do it and what would we need? • To make it move it has to go around like this (showing the movement of a handle) – yes we need a handle! After looking at the children’s list of ideas, a parent who is a carpenter built us the conveyor belt you see in the photos below. When children first saw it, they recognized many of the features they described realized. Every day we’ve had many shoppers arranging their produce on the belt, and thinking together about how conveyor belts work! 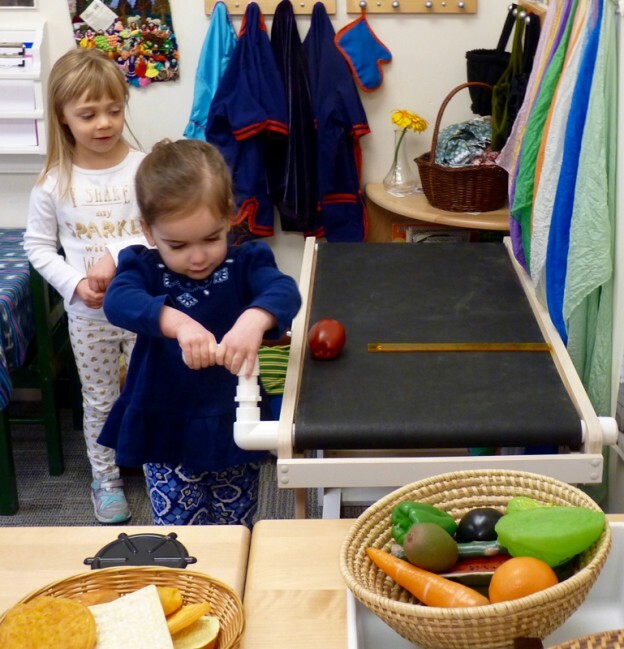 It has been exciting for teachers to see such young children come together to share their common experiences in the grocery, and then plan, problem solve, and design their own tools and space so successfully. This entry was posted in Chickadees, Curriculum, Play and tagged chickadee, children, education, preschool, pretend on March 27, 2017 by Katrina Selawsky.